Israeli warplanes have carried out five airstrikes on the Gaza Strip in the latest wave of attacks on the coastal enclave, which has been under an Israeli blockade for the past five years. 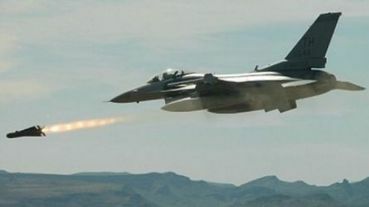 "The airstrikes targeted different areas of Gaza in the early hours of Tuesday. There have been no reports of casualties from the Israeli regime�s latest bombardments. On Monday, Israeli officials said that they were mulling over various options to punish the Palestinians of the territory and had not ruled out the possibility of launching a new war on Gaza. Israeli airstrikes, shelling, and artillery fire have left six Palestinians dead and over 40 others injured since Saturday. Some of the injured are in critical condition. Israel makes me sick to my stomach, as does our support of this war mongering illegitimate country! Most, if not all of our current problems in the middle - east stem from our support of an illegitimate country and our tolerance of their humane treatment of the Palestinian people. I am so ashamed! If the world would just MAKE LOVE instead of WAR. You cannot currently send a star to Carrie because you have done so within the last week. I think you speak for all sane and peace-seeking folks Carrie.. Not to forget that "We" send the Israeli government billions each year and this is st the expense of OUR CHILDREN. They in turn use American dollars to murder who ever they please like Rachel Corey, etc., and steal land and resources..
" Israel makes me sick to my stomach, as does our support of this war mongering illegitimate country! Most, if not all of our current problems in the middle - east stem from our support of an illegitimate country and our tolerance of their humane treatment of the Palestinian people. I am so ashamed! " 03:25 GMT: Internet hacktivist collective 'Anonymous' claims to have taken down the Israeli Defense Ministry website www.idf.il. In a message shared via one of the group's Twitter accounts, they posted the site address with a popular hashtag used for similar actions, 'tango down'. 03:06 GMT: �Increasing number of reports claim Israel is planning to shut down internet services in Gaza, citing IDF. 02:34 GMT: Russia hopes the UNSC will convince Israel to cease fire, said the country's permanent representative in the United Nations Vitaly Churkin. 01:57 GMT: Worldwide protests are being planned to protest Israeli strikes in Gaza. People in the US, the UK, Israel and many European countries plan to gather to show their concern over escalating violence in the Middle East. More..
A letter from an Israeli mother, citizen, who seeks peace not war.. This women speaks truth like only a wise person can..
"The first thing I want to say is: Please don�t defend me. Not like this. I am sitting in my safe room in Kibbutz Kfar Aza and listening to the bombardment of the all-out war outside. I am no longer able to distinguish between �our� bombardments and �theirs." The truth is that the kibbutz children do this better than I do, their �musical ear� having been developed since they were very young, and they are able to differentiate between an artillery shell and a missile fired from a helicopter and between a mortar bomb and a Qassam. Good for them. Is this what �defending the home� looks like? I don�t understand � did all our leaders sleep through their history classes? Or maybe they studied the Mapai school curriculum or that of Education Minister Gideon Sa�ar (to my regret, the difference is not all that great) � and have wrongly interpreted the word �defense�? Does defending the well being of citizens mean a war of armageddon every few years? Hasn�t any politician ever heard of the expression �long-term planning?" If you want to defend me � then please: Don�t send the Israel Defense Forces for us in order to "win." Start thinking about the long term and not just about the next election. Try to negotiate until white smoke comes up through the chimney. Hold out a hand to Palestinian President Mahmoud Abbas. Stop with the �pinpoint assassinations� and look into the civilians� eyes on the other side as well. I know that most of the public will accuse me of being a �bleeding heart.� But I am the one who is sitting here now as mortar bombs fall in my yard, not Sa�ar, not Prime Minister Benjamin Netanyahu and not Labor MK Shelly Yacimovich or Yesh Atid party head Yair Lapid, either. I am the one who has chosen to raise her children here even though I had and still have other options. It is possible to accuse me of a lack of Zionism, it is possible to accuse me of flabbiness and weak-mindedness but it is impossible to accuse me of hypocrisy. My children have served in combat units in addition to their contribution of �year of service� for the country, voluntarily. We live here and we love this country. " Our war is a war for the coloration of the state, not its borders. For its democratic nature and for human dignity in it. For sanity. So please stop killing civilians on the other side of the fence in order to defend me. If you are interested in stopping the hostile actions from the other side � open your ears and start listening. If we are important to you � please stop defending us by means of missiles, �pinpoints� and �aeronautical components.� Instead of Operation Pillar of Defense embark on Operation Hope for the Future. This is more complicated, you need more patience and it is less popular � but it is the only way out. Correction: INHUMANE TREATMENT! So there's no misunderstanding about my choice of words, Illegitimate.. I see my nation, a nation who murdered 30 million people from America's native tribes as an Illegitimate pretender to the throne. I see the actions of Israel in the same dark light.. We murdered children, entire families and stole the lands of these native peoples. Israel, with our blessing, has been doing the very same thing.. Nothings changed! I see the horror of what's going on in Gaza and the entire Middle East. I see it as a violent replay of what "We" did to Nicaragua, El Salvador, etc. Murderers are US and "WE' use religion and or the promise of Democracy as our calling card. "The Gr$$d Merchants Have No Soul" I wonder if there's enough of US left that do! My heart aches for the children of the world because they have no voice. No one that speaks for them at times such as this.. The shame belongs to the living! Terrance thank you for your comments, you certainly touched a nerve and shared some historical truth..
"Let Israel make peace with it's neighbors or let Israel fight it's own wars it creates."